The other day I woke up on the WRONG side of bed. I’m talking fire-breathing-dragon, cranky, contagious, inexplicable bad mood side of bed. The thing is, nothing was actually wrong. There was no trigger or catalyzing event. Berate: Snap out of it! You have too much to be thankful for to be in a bad mood! You are being a huge baby! Children are starving in Africa! Coddle: Awww, what’s wrong? Do you need to take the whole day off to watch Breaking Bad in bed with a box of chocolate? Analyze: Let’s see….what happened recently? Who did you talk to? What is stressing you out? How can we fix this? What’s on your to-do list? If there’s one thing I’ve learned (aka gotten hit over the head with) this year, my year of alignment, it’s that none of these questions should be the first line of defense. They are all flawed. When you are in a bad mood — if the trigger is not immediately clear — it is probably a cry for attention from your body, speaking to you the only way it knows how: through it’s chemical delivery system. “[The enteric nervous system] is equipped with its own reflexes and senses; the second brain can control gut behavior independently of the brain. “The system is way too complicated to have evolved only to make sure things move out of your colon,” says Emeran Mayer, professor of physiology, psychiatry and biobehavioral sciences at the David Geffen School of Medicine at UCLA. For example, scientists were shocked to learn that about 90 percent of the fibers in the primary visceral nerve, the vagus, carry information from the gut to the brain and not the other way around. Have you gotten enough sleep? After just four days of racking up a sleep debt, you will noticed impaired mood, judgment, memory, ability to concentrate, and may even start to gain weight. Can you squeeze in a 20-minute power nap today? Have you spent enough time outside? Vitamin D is the only vitamin that is a hormone, and all the major organ systems in our body need it to function. Vitamin D also helps regulate the immune system and releases neurotransmitters that are key for an elevated mood (just as Vitamin D deficiency is often linked to depression). If you are in a bad mood, DO NOT PASS GO unless you have addressed the above questions. Honestly, without checking in with these three physical areas first, what’s the point? If any or all of these three things are out of whack, your brain chemicals are just not on your side, and they are begging for attention. You can try to troubleshoot your mood without them, but it’s going to be a hell of a lot harder and more confusing if there’s nothing in your “real world” that actually seems off. Bonus questions: look at the foods you’re eating, recent alcohol consumption and even whether you’ve had enough quiet time or meditation. And lest you think I’m sharing this from a preachy high-horse, let me assure you that my heightened awareness around all this comes from a place of survival. I am sensitive and prone to depression. This has been a roller-coaster year for me — much more on the inside of my crazy brain than outside of it, and I knew right from the start that I would need every damn drop of happy chemicals my body’s got to have even a fighting chance at peace and equanimity. So when my mood feels maddeningly off and I am tempted to start troubleshooting with my mind, I have learned to slowly and counter-intuitively put the brain questions down and turn to my body first. How do you get your body right? 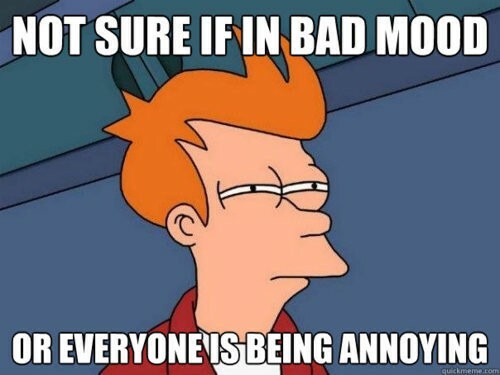 What troubleshooting questions do you ask when you find yourself in a bad mood?